Battle hard within the gritty world of Acid Rain! This Acid Rain Sand Speeder Mk. 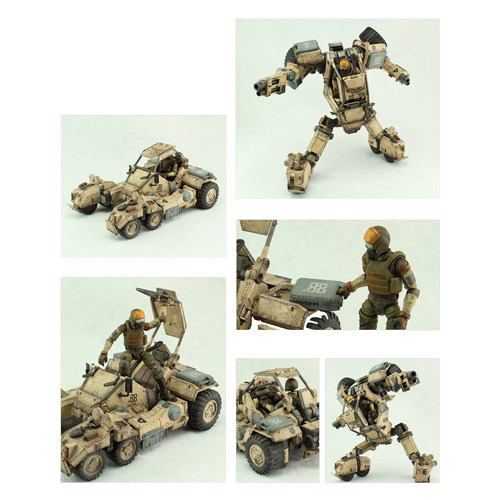 II Transforming Mecha Action Vehicle is what action figure and toy fans have been waiting for! Able to house a 3 3/4-inch action figure in its cockpit, this awesome vehicle even transforms! Drive your Sol action figure to battle in style when in Vehicle Mode, or do some real damage and put it into Armor Mode! Complete with roll cage and seat belt in the cockpit plus removable case for the pilot, this fantastic vehicle even includes a Sol Commander Pilot Action Figure! In Armor Mode, the Speeder measures 9 1/4-inches tall x 5 1/2-inches wide x nearly 4-inches long. In Vehicle Mode, the Speeder measures 8 1/4-inches tall x 5 1/2-inches wide x 3 1/4-inches long. Each Sand Speeder Mark II Transforming Mecha Vehicle comes with either a "Star" or "Pin-up Girl" decal. Ages 6 and up. Requests for specific decals cannot be accommodated.